After jumping on the bike and Lycra bandwagon I quickly realised that all good cycle rides need to include a stop at a suitable cafe or tea room, but how do you find them and which are the best ones? 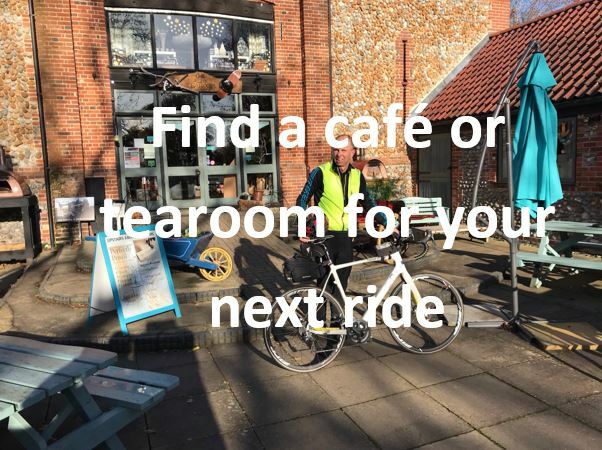 With the aid of a new bike, a phone based spreadsheet and my scoring system I aim to locate and rate the top cafes and tearooms throughout Norfolk and beyond. So if you want to know the best routes and cafes for your cycle ride then this is my guide. I have visited over 200 cafes in East Anglia plus many more further afield (in Great Britain, into Europe and across India). All of which have been written about on my blog. The reviews, routes and special rides (such as my recent ride across India) can all be found on the website. ​There is also news of my annual search for thing of the year, which is the brownie in 2018 (2017 Sausage roll, 2016 Flapjack, 2015 cheese scone, plus other exciting features. How does my cafe rating work? (Remember it's just my opinion based on what I find on the day). What qualifies as a Cafe or tearoom? It must be independent and not be part of a chain (I don't plan to go to every (or any) Starbucks or Costa etc). If it is part of an attraction or garden centre then there mustn't be an entrance fee to get to the cafe. It must have at least 1 home made type of cake on offer. I like hot chocolate and cake so the ratings are weighted towards these. I'm looking for a thickish drink that has a distinctly chocolate taste. Most common issue is when the focus has mistakenly been put on the HOT rather than the CHOCOLATE part of the drink. A steaming anaemic drink, where the chocolate powder has been waved past the cup, with the resulting beverage tasting of burnt milk doesn't really do it. A standard Cadburys drinking chocolate gets a 6 (unless it is weak or cold). My cycling guest (or guests) get to rate their hot drink (soft drinks don't count). There is more inconsistency here as type of drink and reviewer is much more variable. But it is rare for there to be a big difference between the HCQ and GHDQ and if there is I probe my guest further on their rating basis to try and get consistency. Again the temperature, strength and flavour are the key factors. The number of home made style cakes (e.g. nothing in a plastic wrapper) are reviewed and factored against how many I would actually like to try to give the effective cake selection (ECS) score. There is no absolute algorithm allowing for adjustments on just how tasty and desirable they look. Having 4 or 5 cakes I fancy would give a high score. Straight forward score of how good the cake tastes. If my cycling guest/s have also had cake then we agree a combined rating, although in the result of any disagreement my decision is final as I have more cake tasting experience to fall back on. Whilst sitting enjoying our refreshments we agree an AAA based on factors like view, noise, space, layout, feel, cycle friendliness etc. Each is rated out of 10 and the following unweighted formula; (HCQ+GHDQ+ECS+CTQ+AAA)/5, is used to give the overall cafe or tearoom rating. I score the cafe on every visit but to keep ratings current only the last 3 scores count. If a previously visited cafe is under new management when being revisited then any previous ratings will be discarded and the current visit would count as the first effectively wiping the slate clean. For further consistency, once rated, I moderate the cafe against others of a similar rating to make sure the score feels right and they are a comparable cafe or tearoom.